How long did it take you to get to school when you were a child? In the old days kids usually walked to school, but today, it seems that many students get dropped off by their parents in SUVs. In Malaysia, life has definitely changed. The thought of letting your child walk 4-5 kms to school on their own would be unheard of. In places like South Africa, this is the only way children can get to school to receive an education. But because of your child sponsorship, World Vision is changing this for thousands of children across the country. Take this High School in the Giyani project of north-east South Africa for instance. While in South Africa, I met Alive (yes, his real name!) He and his mates walk about four km’s each way to school every day. Not only is this unsafe, it means that students are spending most of their time travelling when they could be doing their homework or playing with friends. However, for Alive, this is not a long way compared to other students at his school. An even bigger picture reveals that South Africa was placed 115th out of 144 countries with regard to children’s access to primary schools. It’s no wonder that only 40% of children who enrol in Grade one achieve a qualification higher than Grade nine. So what is World Vision doing? We have partnered with Qhubeka, World Bicycle Relief’s program, to provide bikes to students across our child sponsorship projects. In the Giyani project where I visited last year, I participated in the unloading and registration of 490 bikes going to students, including sponsored children. Students undertake a contract to not only maintain the bike but to go to school – part of the incentive is that after two years they can keep the bike if they attend a sufficient amount of school in that time. They are also given basic maintenance training as well as a, helmet, padlock and pump. How do I know it will make a difference? Based on two other projects, their results show that attendance has increased from 35% to 82%, homework completed each day has increased from 24% to 88% and travel time has decreased for 72% of the students with bicycles to less than an hour. Not only are fewer children missing important classes, the number of children who feel safe travelling to school has more than doubled. But that’s not all. The bicycles are helping out our staff too. Singita is one of the Community Care Agents who recently received a bicycle from World Vision. Singita, along with other volunteers like herself work with World Vision to monitor the needs of community members and sponsored children. “Before I had a bike, I used to visit only five families a day, but now I can cover up to 12 families in a day,” she told me. It’s great to see that the provision of a bike can transform the way the community operates and have such a significant impact on a child’s safety and education. Since I visited the Giyani project last year, the program has worked so well in that another 1,200 bikes will be delivered there this year. In addition, another 900 have been promised to the two other World Vision Sponsorship projects, Umzimkhulu and Ixopo, in 2016. Support children like Alive, who deserves the opportunity to live healthily and to realise their dreams they never thought of. You can help turn a child’s life better and fill it with so much hope by Sponsoring A Child . It wasn’t odd for nine graders in Julia’s class to be speaking of engagements and weddings. Even two of her friends who aged only 14 years old were about to tie the knot. No matter how frequent these talks were among these young teenagers, Julia never stopped feeling like an outcast. She always thought that she was different, but she could never tell whether she was right or wrong – until she was introduced to World Vision (WV). Julia is an active member in one of World Vision’s youth committees in Lebanon. With funds from Australia, many child-focused activities were being implemented by World Vision in several towns in the Akkar area – north Lebanon. Her uncle, who happens to be the town mayor, advised her to attend one of WV’s activities. “It was a session around violence against children,” she recalled. “I was absent-minded the entire way back home, after the event. I felt awful, because I sometimes hurt my younger brother, either by calling him names or hitting him.” Julia felt that she learned something valuable, and she felt the need to engage in more activities. Thus, she did and this is how Julia started her journey with World Vision, three years ago. his surroundings. “I learned from World Vision that if I share the information I have with one person only, I can make a difference.” Julia’s first step in sharing knowledge with her friends was after World Vision held a session around handwashing awareness. The following day, Julia took to school leaflets which show the different stages of handwashing and passed them to her classmates. Many activities left an impact in Julia’s heart after the play. One of them is her own suggestion– to paint on a big water tank, in the middle of the town, drawings about child rights. “I never felt as powerful as I do now because of World Vision. If I was able to spread awareness about several issues within these three years, imagine what all of us can do in one lifetime,” Julia stated. The thought of World Vision ending its projects in Julia’s hometown saddens her; however, she is not worried. “World Vision gave me a treasure in these years. Teaching us about our rights is a life-long weapon,” said Julia who vowed to maintain this continuous work; even when she grows up and studies medicine. 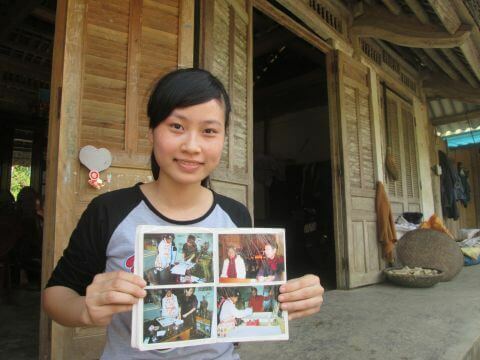 Her ultimate goal is to build a new hospital for her town, where all the people can receive treatment for free. “I dream of this because World Vision taught me to give a hand to the poor – especially the children,” said Julia who knows now that the speech of a 14-year-old should be full of powerful dreams and hopes for a better future. Support children like Julia, who deserves the opportunity to live healthily and to realise their dreams they never thought of. You can help turn a child’s life better and fill it with so much hope by Sponsoring A Child .